peptide complex (with dipeptide diaminobutyroyl benzylamide diacetate), Relistase peptide complex (with acetylarginyltryptophyl diphenylglycine), ARGIRELOX peptide complex (with acetyl hexapeptide-8, pentapeptide-18), Probiotic complex (with Lactococcus lactis lysate), in a base of 11 skin-friendly amino acids and multiple hyaluronic acid complexes. The "Buffet" + Copper Peptides 1% formula differs from our original "Buffet" as this formula includes a 1% concentration of GHK-Cu (Copper Tripeptides) which focuses on skin health (based on the natural role of these peptides in the human body) and has a very high long-term value to the skin. The inclusion of Copper Tripeptide gives a natural light blue colour to the formula. The total concentration of these technologies in the formula by weight is 26.1%. Directions: Apply to the entire face in the AM and PM after cleaning. I noticed an immediate firming of my Â± 50yo skin. Temporary of course but remarkable. Also decreases my overall dryness. Will see what happens long term, but so far very much enjoying. I find the smell very subtle and quickly dissipates. Love this, smells awful but works great. I use regular Buffet in the am and this one at pm, my skin is glowing from the Ordinary products. As with all The Ordinary products Iâ€™ve tried, this one is top notch. Good things come to those who wait. If you want lasting benefits, you have to often wait for them. That is the case here. Be patient and you will not be disappointed. The Buffetâ€”and all the products of The Ordinary I have used on my skinâ€”are first-class. In the course of a few months, my skin has so noticeably changed in texture, in smoothness, and in evenness and youth of colour that my friends are remarking on it. I am 70 years oldâ€”so the difference is really marked. Impressive! This is excellent. I have tried the Buffet product from this line, and I find this Buffet Copper Peptide to be a little better. It has a slightly sour smell to it, but other just as good if not better than the Buffet. It brings hydration without clogging the pores, and brightens the skin. I've used it for about a couple of weeks now, and I'm noticing a nice subtle glow. So great. One of my favorite products from The ordinary. The Ordinary is officially my favorite skin care line, products are simple and effective. This product is a great solution for getting necessary molecules into your skin for healthy glowing skin. I like The Ordinary because they have specific products that for the most part can be combined with each other or with other products. Haven't noticed any rust. I like that you don't need much. I believe it's starting to make my skin smoother and fade some age spots. It's rusting on your face. The moment an acid comes in contacts. So if you use any acid in your regimen. It's a no. And it takes hour for the rust to colour. So you can realize hours later that you were going around in the office with orange rust streaks or finger prints for god knows long. Which let me to believe that the cooper doesn't penetrate my skin and just sits there. I LOVE the regular buffet. The cooper is a downgrade. This is a wonderful product for so many reasons. It is hydrating and smoothing and is working to reduce visible signs of aging. In the am use it in conjunction with the Ordinary's Hyalaronic Acid, then EUK, followed by NMF as part of an anti aging routine. At night I exchange the NMF for any of their lovely facial oils such as Rose Hip, Squalane or Marula. Instantly transformed my skin - felt smooth and a little velvety. Looked radiant. I have noticed after incorporating The Ordinary serums into my daily face routine that Iâ€™ve had a few blemishes arise. I believe they were just lurking below the surface for some time and they may not be related. 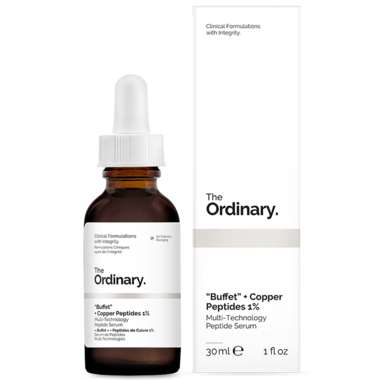 Regardless, I will keep using The Ordinary serums, especially the Buffet! Same texture as the original Buffet and use in the same way. Canâ€™t say I have seen any obvious results with the Copper Peptide addition so far but no adverse reaction either.